A black and white negative of the residence of Mark Crawforth. The large brick house was photographed from the front. It has two chimneys. A second residence is visible behind two trees. 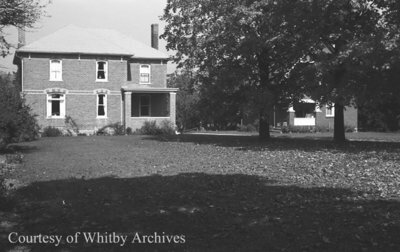 This house was built about 1878 by Whitby Township farmer Mark Crawforth (1857-1934) about the time of his marriage. It was located on the north side of Base Line at the Whitby - East Whitby Township border. The house was demolished circa 1998. The farm was was demolished for the construction of Highway 401 in 1939. Crawforth Farm, October 12, 1938, Marjorie Ruddy. Whitby Archives A2013_040_774A.